The Democracy and Human Rights Party sees 17 of its 18 candidates fail a vetting process that has barred several Muslims from contesting the election. RANGOON — The Democracy and Human Rights Party, which claims to represent Burma’s Islamic constituents, looks likely to become one of the first institutional casualties of a candidate vetting process that has disproportionately seen several Muslims barred from contesting a general election due Nov. 8. Of the 18 Muslim candidates put forward by the party for scrutiny by the Union Election Commission (UEC), 17 have failed to pass muster, according to DHRP chairman Kyaw Min. If its appeals are rejected by the UEC, the party would be left with only one contesting candidate, slating it for deregistration under a Political Parties Registration Law provision that stipulates a party must field at least three candidates or face official delisting. Most of those rejected were told that they did not meet citizenship requirements, including that both parents of a candidate be citizens of Burma at the time of the candidate’s birth. 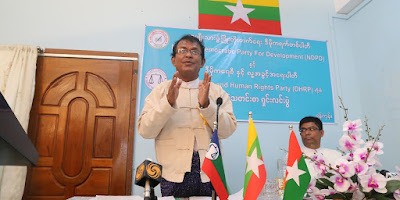 Kyaw Min, who was one of the DHRP’s rejected candidates, said the purported explanation was “ridiculous,” given that he was allowed to contest Burma’s 1990 election. Last week, sitting parliamentarian Shwe Maung, a self-identified Rohingya Muslim, was similarly told that his application to run for re-election was rejected on grounds that his parents were not citizens when he was born. Shwe Maung currently represents the ruling Union Solidarity and Development Party (USDP) in Parliament’s Lower House, but had opted to run as an independent in the November poll. On Tuesday, Shwe Maung appeared at the Arakan State election subcommission in the state capital Sittwe to appeal his rejection. But Matthew Smith, director of Bangkok-based Fortify Rights, said Shwe Maung was “further disqualified” this week, with officials apparently having made the decision without first hearing his appeal. Smith, who accompanied Shwe Maung to the subcommission office on Tuesday, said the spurned parliamentarian plans to take his case to the UEC in Naypyidaw. “Sadly, this reflects a broader anti-Muslim trend in the country, and it’s going to leave an unfortunate stain on the upcoming election if citizens of Myanmar are not allowed to participate freely in the political process,” Smith told The Irrawaddy by phone. At least 19 candidates have been rejected by the Arakan State election subcommission, with a large concentration of the rejections in Maungdaw District where many Muslims reside, according to Khin Maung Than, who is head of the Arakan National Party’s Maungdaw branch. Nyi Phu, head of the Arakan State chapter of the National League for Democracy (NLD), told The Irrawaddy that one candidate from Burma’s largest opposition party had his bid disallowed because the individual had failed to meet a residency qualification mandating that prospective candidates must have lived in Burma for the last 10 years. The Myanmar Times on Tuesday reported that 49 candidates in total had been rejected by the UEC, indicating that Arakan State accounted for at least 40 percent of candidate rejections nationwide. The disproportionate share of rejections both reflects the western state’s complex ethnic dynamics and highlights the thorny issue of unresolved citizenship for much of its Muslim population. In addition to the DHRP, the National Development and Peace Party (NDPP) and National Democratic Party for Development (NDPD) are also known to court the Muslim vote and have both reportedly had candidates rejected. The DHRP’s Kyaw Min, whose party is in contact with the NDPP, said he was told that six of the six candidates submitted by the NDPP in Arakan State were denied election commission approval. Kyaw Min said he did not believe the fellow Muslim party had planned to field candidates elsewhere in Burma, meaning it too could be deregistered for failing to meet the three-candidate threshold. NDPP chairman Ali Hussein declined to comment when contacted by The Irrawaddy on Tuesday. The chairman of the Arakan State election subcommission, Aung Mya, told The Irrawaddy that he could not provide figures statewide on the number of candidate rejections, but he confirmed that 19 applications had been turned down in Maungdaw. He said more information on the state’s other districts was expected in the coming days, delayed by transportation difficulties arising from flooding in the region. NDPD chairman Maung Ni said his party had submitted six candidates and saw two rejected, while the secretary of the Kaman National Development Party, Tin Naing Win, said his party’s four candidates had all successfully cleared the UEC vetting process. Unlike the Rohingya, Kaman Muslims are recognized as one of 135 official “national races” in Burma’s 1982 Citizenship Law. Many stateless Rohingya Muslims were allowed to vote in Burma’s 2010 election on the basis of their holding temporary registration certificates, commonly known as “white cards.” At least two Muslim candidates were elected to the Lower House, and the NDPD saw two of its candidates elected to the regional legislature. But earlier this year, a presidential order invalidated the white cards, disenfranchising hundreds of thousands of Rohingya and other minorities who also lacked full citizenship.